Solid bass construction for reliability and long lasting performance, SEDAL ceramic disc cartridge and Neoperl Aerator formed the faucet. Commercial Antique Pull Out Design - Easy to clean the sink without blind spots. 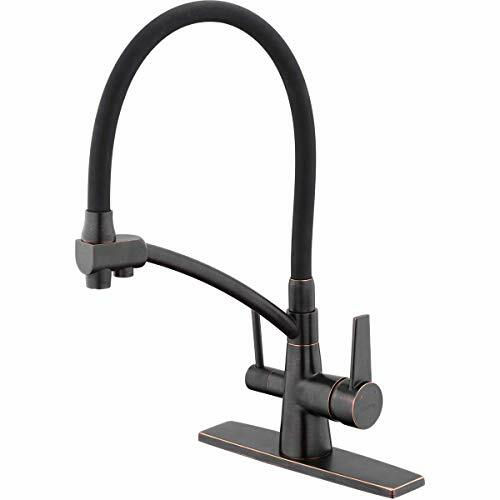 Premium Ceramic Disc designer faucet: smooth stream/spray water flow, drip-free. Durable Oil Rubbed Bronze Finish: Superior corrosion & rust-resistant finish. Classical design, fits to different kind of kitchen sink. We sale the matching deck plate. 3 Way Kitchen Faucet - Include Hot & Cold and RO water (under sink filtration system ) faucet function for save your space and money. Advanced nozzle with 1 setting mode, stream function, mix hot and cold. Support No Additional Tool Install - Complete tool accessories. U.S. Standard 3/8" water hoses fit most US kitchen pipe, 1/4" drinking water supply tube.